Despite the many designs, settings, and styles available, diamond solitaire engagement rings remain the bride-to-be's most timeless and popular choice. While it may seem deceptively simple, a diamond solitaire can still be a unique ring designed to suite any taste. Simply put, solitaire means one. For an engagement ring, this means the ring has one simple diamond, without side stones, accent stones, or other gem embellishments. Solitaire engagement rings need not be dull or plain, however, and for many women, the simple elegance of a single, sparkling stone is the ultimate symbol of the single love two people share. At first, it may seem that in order to have an engagement ring use a single diamond, the stone must be larger than average. There are many alternatives to choosing a larger stone, however, that highlight the characteristics of the ring rather than the sheer size of the diamond. A smaller stone paired with a thinner band helps emphasize the diamond and produces a delicate solitaire ring, perfect for slender fingers. The band can be two-toned or etched to add intricacy and depth, or it can be given an unusual shape such as a wave or curve that draws attention to the ring as a whole rather than just the diamond. While the most popular shape is the round, there are many other diamond shapes that can create a beautiful ring without additional stones. Marquise, emerald, pear, and oval-shaped stones all elongate the diamond and appear larger than they may be. A single heart or trillium-shaped stone is distinctive and eye-catching for its uniqueness, minimizing the importance of the stone's size while the eye focuses on the shape. Creating a two-tone ring or using a higher-quality metal than the standard 14-karat gold adds elegance and beauty to diamond solitaire rings and emphasizes that the band is as much a part of the ring as the stone. Higher grades of gold, such as 18K, have a richer yellow hue that stands out as a quality piece. White gold, as well as platinum, rings are noted for simplicity and monochromatic sophistication. Two-toned rings may incorporate elements of copper or brass for unusual hues. Rose gold is a unique choice that is naturally distinctive. 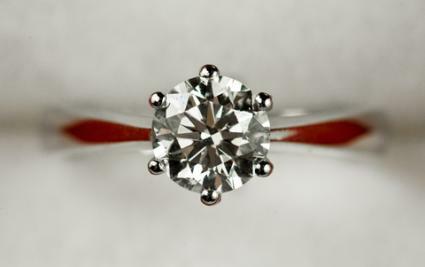 The most popular setting is the prong setting, in which the size and number of prongs can vary to highlight the best features of the stone. Bezel, flush, tension, and arched settings are also appropriate choices. Fancy settings provide a way for the band to be very intricate and personalized yet not use additional accent stones. The may include words, engravings, or filigree designs along the sides of the band where the arch would occur on simpler settings. 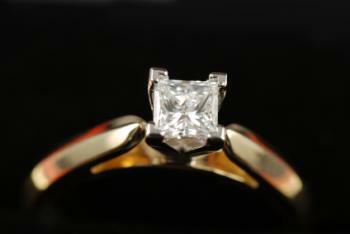 Because there is only one stone, channel settings are not recommended as they will obscure the best qualities of the diamond. Because the ring has only one stone, couples considering diamond solitaire engagement rings must be well acquainted with judging diamond quality. A ring with several stones or other gems as design elements may be able to use a lower quality diamond to good effect because the more elaborate settings, colors, and designs distract from any imperfections. 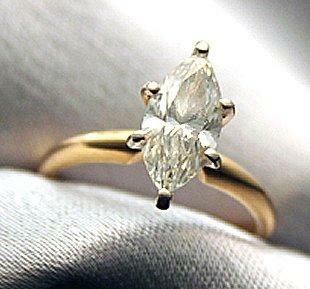 The focus of diamond solitaire engagement rings, however, is one brilliant gem. Therefore, you should be familiar with the four Cs of quality (clarity, cut, carat, and color), as well as potential flaws in order to ensure that you have an excellent stone. Because a solitaire is one diamond in a relatively simple setting, it has the potential to be far less expensive than many choices. On the other hand, because the stone is typically a higher quality, larger size, or better grade, that may increase the price significantly. As with any engagement ring, the price tag should reflect the budget that the couple is comfortable affording, and the stone's characteristics can be adjusted to match any style considerations. Despite growing trends toward individuality and personalization, many women prefer the timeless elegance of diamond solitaire rings. Even with the limits that a single stone puts on ring design, it is possible to create a unique and gorgeous ring. A traditional solitaire is a symbol not only of the couple's enduring love, but of the single life and hope they share for their future.